스마트폰(갤럭시 노트 8)으로 촬영한 행성들과 달 사진입니다. 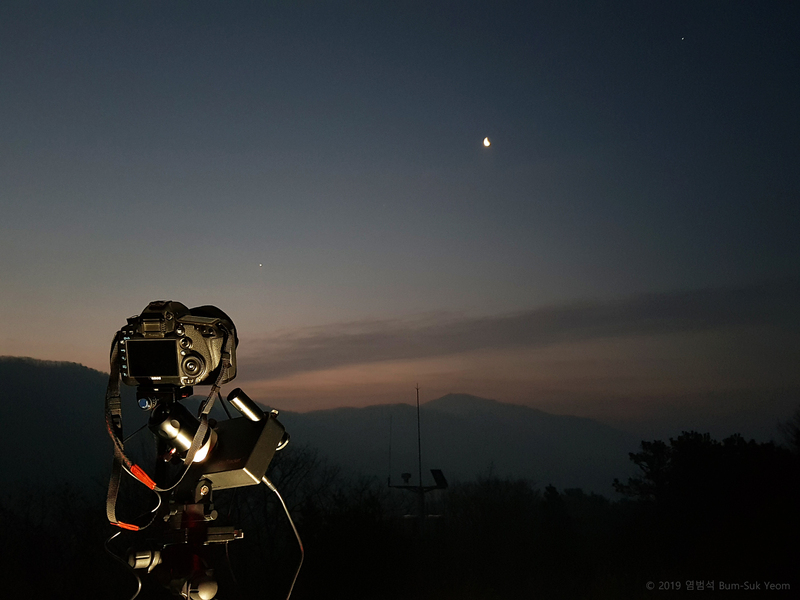 Taken by Bum-Suk Yeom on February 28, 2019 UTC @ Jangsu, South Korea. 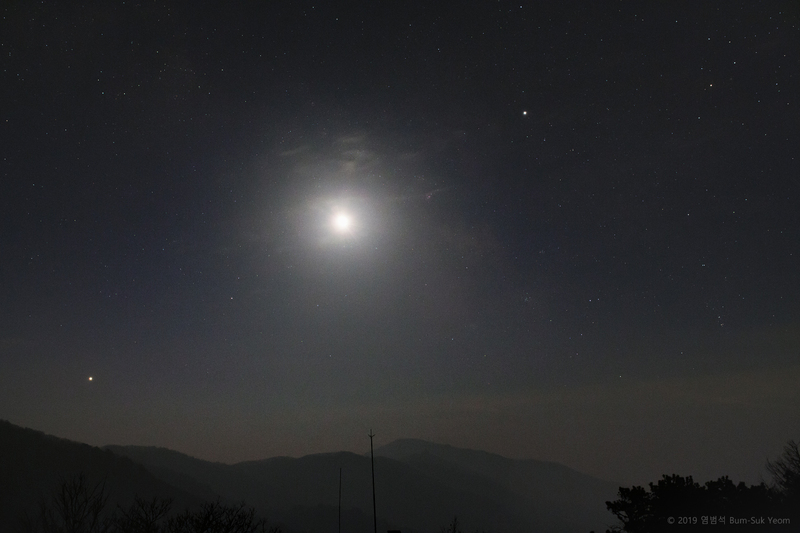 Details: 21:30 UTC (06:30 March 01 KST), Galaxy Note 8 smartphone camera, ISO 250, f/1.7, 1/10 sec. Venus, Saturn, Jupiter, and Moon. 금성, 토성, 목성, 그리고 달. 새벽에 촬영한 행성들과 달 사진입니다. 자세히 보면 달 근처에서 여름철 은하수를 희미하게 볼 수 있습니다. 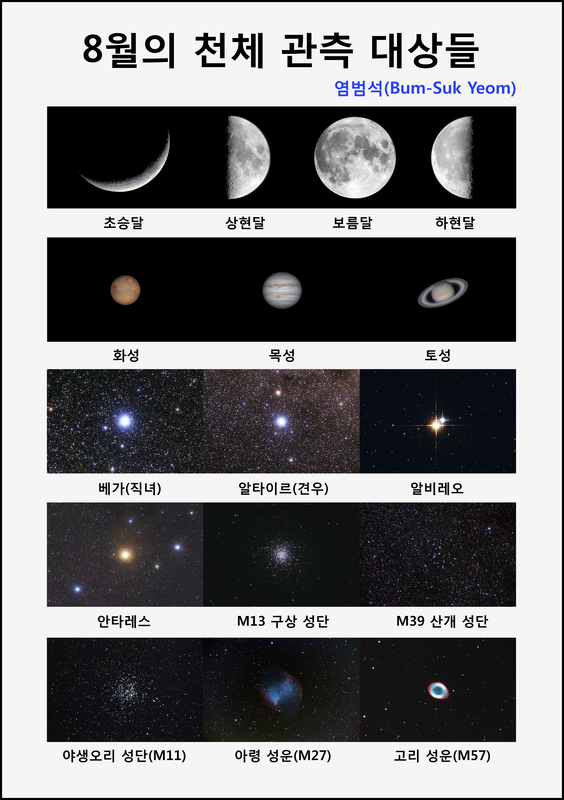 Taken by Bum-Suk Yeom on February 28, 2019 UTC @ Jangsu, South Korea. Details: 20:53 UTC (05:53 March 01 KST), Sigma Art 35mm lens with EOS 5D Mark III camera, Skytracker mount, ISO 3200, f/4, 5 sec. 태양계의 가장 밝은 행성들인 금성과 목성은 1월 말에서 2월 초까지 새벽 남동쪽 하늘에서 가까이 접근합니다. 이 장면은 일출 1시간 전에 남동쪽 하늘에서 볼 수 있습니다. 금성과 목성은 약 1주일 동안 새벽 남동쪽 하늘에서 서로 접근해 있습니다. 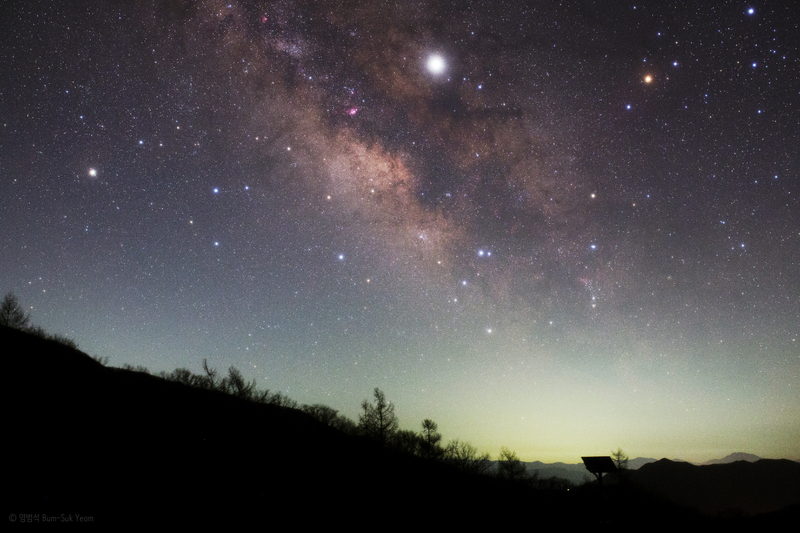 Venus and Jupiter form a spectacular pairing in the dawn sky during late-January. 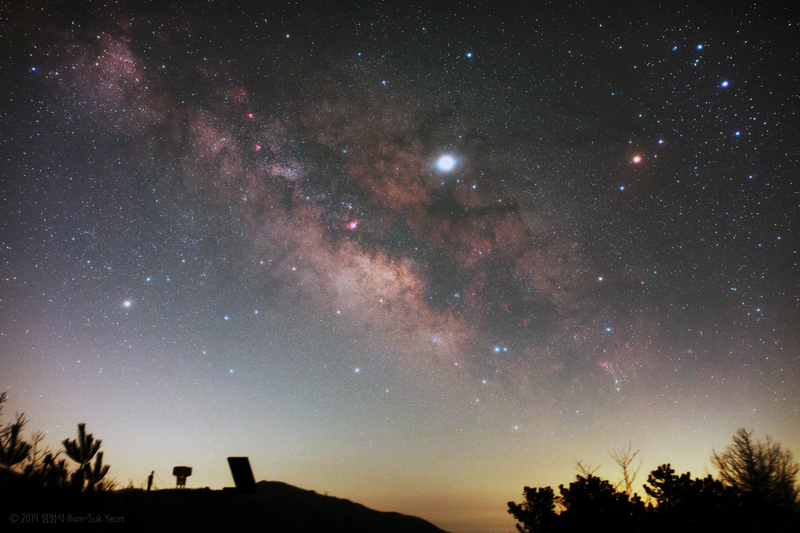 These scenes show the sky's appearance looking southeast about an hour before sunrise. 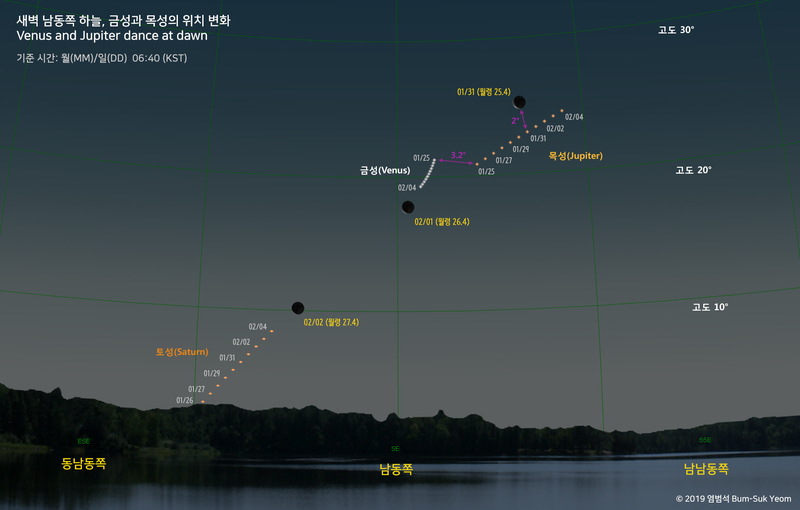 Venus and Jupiter have been approaching each other in the southeastern dawn sky for a week. 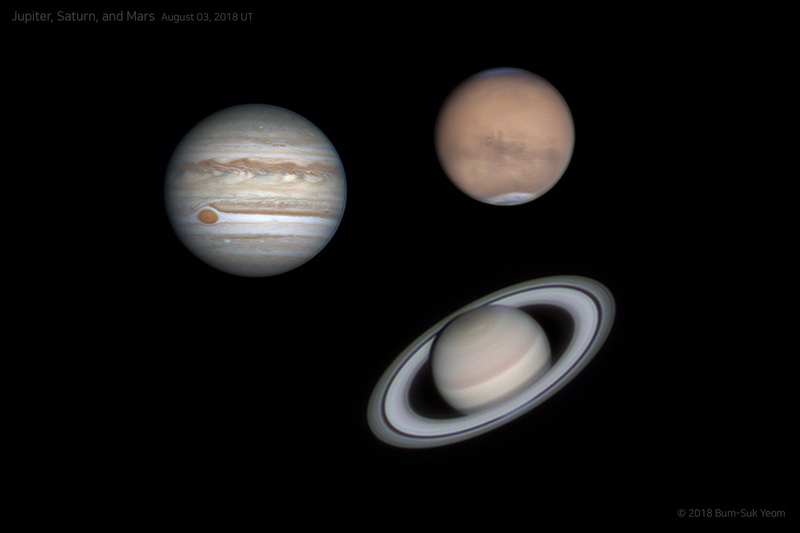 2018 Mars, Jupiter, and Saturn. 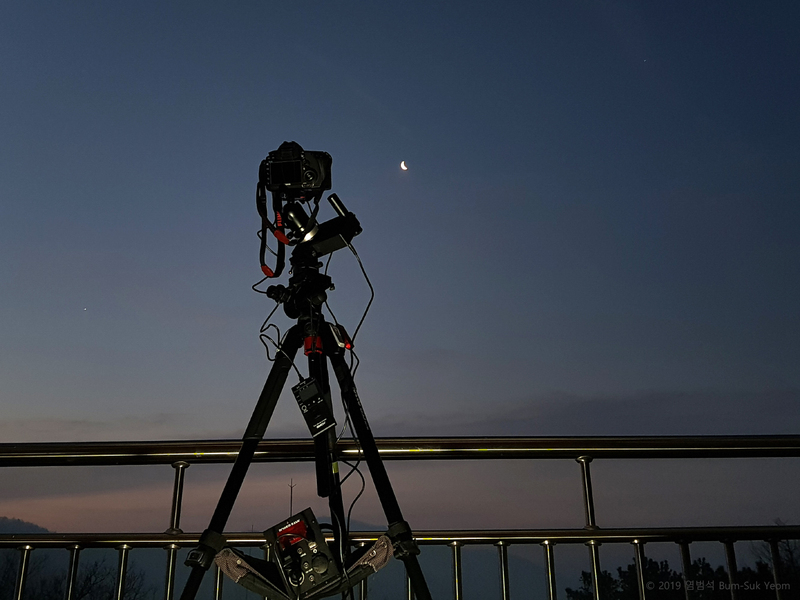 Taken by Bum-Suk Yeom(염범석) on August 3-8, 2018 @ Iksan, South Korea. APM Apo 12inch Refractor + ASI 224MC camera, x2 or x3 Barlow Lens, ZWO ADC. Jupiter, Saturn, and Mars. 목성, 토성, 화성. 2018-08-03. Mars, 03 August 2018, 12inch Refractor, ZWO ASI224MC, x3 or x2 Barlow Lens, ZWO ADC, Iksan, South Korea. 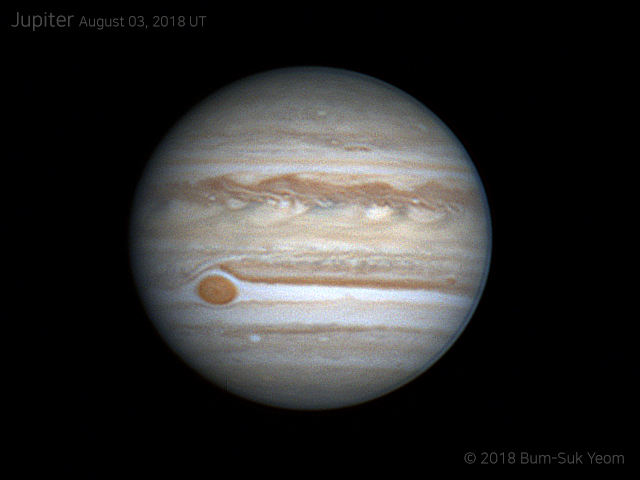 Jupiter, 03 August 2018, 12inch Refractor, ZWO ASI224MC, x2.5 Barlow Lens, ZWO ADC, 61sec movie (7809 images) stack, Iksan, South Korea.